Shared decision making is a model for the doctor-patient relationship that’s gaining support across the country from the Mayo Clinic to Dartmouth-Hitchcock Medical Center. Even Congress has a program to promote shared decision making in Section 936 of the Affordable Care Act. Shared decision making is what it sounds like: The process by which a clinician and patient decide together on the best course of action at any given time. This can relate to diagnostic tests, elective surgery, even cancer treatment. Some experts believe this model is emerging in response to paternalism and third party intrusion into medical decision making. Others say it takes into account the complex trade-offs inherent in medical care and engages the patient in a more powerful way. So how does this play out in real life? As I mentioned in my introductory letter, healthcare professionals have certain assumptions about their patients. It’s your job to communicate your knowledge base, to share your opinions and values, and to let your medical team know your preferences. Are you surprised to learn that most medical decisions offer more than one way to proceed? If shared decision making relies on a mutually respectful and trusting relationship between patient and physician, then the patient has just as much, perhaps even more responsibility for nurturing that relationship. Renowned physician Dr. Jerome Groopman, author of How Doctors Think, speculates that once a patient starts talking with a physician, he or she will be interrupted within the first 18 seconds. Clients frequently tell me they left a much-anticipated visit with a physician unsatisfied because they felt rushed, were repeatedly interrupted, or just did not feel heard. One approach I have suggested in past newsletters is to take control of your meeting by creating a written agenda to guide the discussion. Another favorite tip I like to share with clients: Stay dressed until it’s actually time for the physical examination! I know this sounds a little rebellious, but it’s much easier to share in the decision making process when you’re seated in a chair and maintaining eye contact instead of sitting on a table in a drafty gown. If your physician has eyes on a computer screen and not on you, politely ask if the documentation of your visit could occur after your discussion. Not only should you prepare in advance what to talk about, but come to the visit with written information. While there are all sorts of systems available to track healthcare information, I suggest my clients use the tool that’s easiest and most relevant to them. For me, a three-ring binder with tabs, Microsoft Word, and Excel printouts works just fine. A folder or file box works well, too. Review this article in my October 2010 newsletter on how to maintain important documents. If you are fortunate enough to receive care from a healthcare system that uses electronic health records (EHR) with patient access, please learn how to use them. One terrific benefit is you can review your own diagnostic testing results. 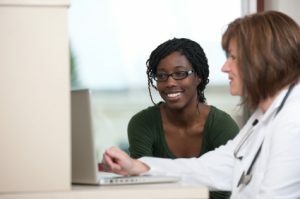 If you are not sure what the results mean, contact your physician in between appointments or make that an agenda item. Also, many physicians and their office staff use email these days. Being open to new modes of communication demonstrates to your physician that you are taking responsibility for your care and doing your part. 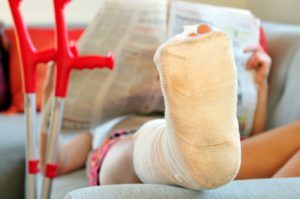 When Erin, a married 42-year-old mother of two called me back in January, she had just come from a visit to the Orthopedic Urgent Clinic at her local academic medical center. A bad fall while skiing the weekend before left her with a swollen knee and a lot of pain. The diagnosis: a torn anterior cruciate ligament (ACL) and fractures in both leg bones. The physician’s assistant told her reconstructive surgery was probably necessary and scheduled a consult with a surgeon for three weeks later. With two young boys at home, Erin’s family lives a pretty active lifestyle. Living in Western New York they ski, bike and hike together. Like many who suffer an injury like this, Erin took to the Internet and read everything she could about torn ACLs, reconstructive surgery and the lengthy rehabilitation required. She considered the option of having no surgery at all and decided that an active lifestyle was more important to her. So when she met with the surgeon weeks later, she felt informed, but was still a little surprised when her surgeon asked her which type of graft she wanted to use for the reconstruction: hamstring, cadaver or patella. Here’s where the values and opinions of the patient are crucial in shared decision making. Erin’s surgeon presented the medical data on all three types of grafts and explained that he preferred to use the patella, which could result in a slightly slower rehab process starting out. While eager to get back on her feet as quickly as possible, Erin’s final decision was based on a number of factors, but one criteria she weighed quite heavily was the surgeon’s preference in the operating room. She chose the patella graft and today is well on her way with her rehabilitation regimen.